Tight consolidation after Tuesday's rally keeps recovery limited for now and fails to benefit from positive signal on bullish outside day, left on Tuesday. Weaker dollar on renewed risk appetite on optimism over US/China trade talks, maintains positive sentiment, with fresh bullish momentum and stochastics' reversal from oversold territory, adding to positive signals. On the other side, south-heading daily MA's in full bearish setup and forming multiple bear-crosses, maintain pressure. 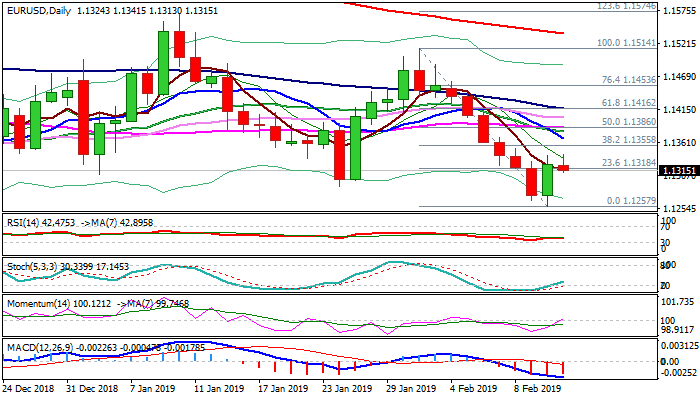 Recovery stays so far under pivotal Fibo barrier at 1.1355 (38.2% of 1.1514/1.1257), break of which would ease existing bearish pressure and open way for further recovery. Downbeat EU IP (Dec m/m -0.9% vs -0.4% f/c) data may further weaken near-term structure and signal an end of recovery.